Instant Imprints Corona, CA | Custom T-Shirts, Embroidery, Signs and More! 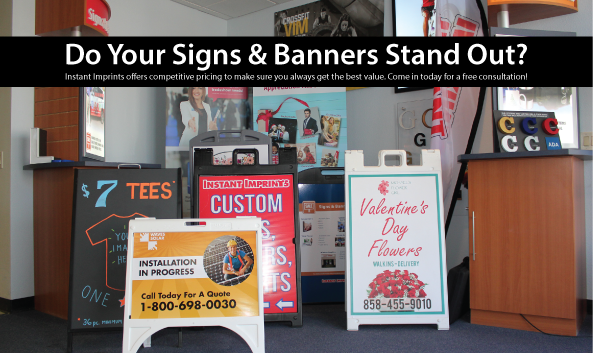 At Instant Imprints Corona, our customers come to us when they want to be more visible to their customers. We create that visibility five different ways: Branded Apparel (embroidery), Signs & Banners, Promotional Products, Custom T-Shirts and Print Services. Working with Kim and her staff is a pleasure. They have a can do attitude and always deliver a quality product in a timely manner. I would recommend them for all your printing, advertising and graphic needs. If your business is in the market for custom t-shirts, printing services, promotional products, custom banners or branded embroidery items, Instant Imprints in Corona has some of California’s best promotional products and services. Your business can stand out with a custom t-shirt, banner or promo item, so that your brand visibility can be brought to new heights. A Instant Imprints, you get the quality and value of a global leader combined with the unique attention-to-detail that our local Image Experts can provide. Do you have questions about what kind of design or printing process would be best for your project? Our Image Experts are happy to understand your goals and answer any questions you may have. At Instant Imprints in Corona, you can make the most of your promotional strategy by using the highest quality printed goods and branded promotional items around. If you ask your smart speaker “Where’s the best place to get custom t-shirts near me?” Instant Imprints in Corona is the answer! All across Cali, custom t-shirts bring brand logos to the masses. When you have a stylish logo, prospective customers will want to show off your custom goods. Custom t-shirts can be given away in order to attract new prospects, or you can sell them as a way for your most loyal customers to show their support. No matter what promotional strategy you utilize for your custom tees, it’s important that they’re of the highest quality. Look no further than your Corona Instant Imprints to find state-of-the-art production processes that give you the best custom t-shirt around! Custom banners and signs are one of the most effective way to bring your brand to the street. Whether you want to advertise on the interstate or the sidewalks of Corona, there’s a custom banner solution that can meet your business’ needs. Let our Image Experts help you pick the right combination of colors, materials and design features to get your brand the visibility it deserves. Stop by our showroom on Lincoln Avenue, give us a call at (951) 738-0664 or request a quote online to take your first step toward a better brand today!